Janice Yeary 81, resident of Ponca City passed away at home with family on January 11, 2019. Her funeral will be held on Thursday, January 17, 2019 at 2:00pm at the First United Methodist Church located at 200 S. 6th Street in Ponca City with Rev. Mike Smith officiating. Arrangements are under the direction of Trout Funeral Home & Crematory. 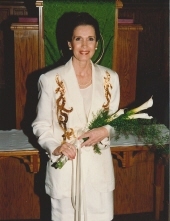 Janice Small (Perry) Yeary was born On January 6, 1938 to Hubert Kennedy & Florence Small in Blackwell, OK. Janice was a homemaker and entrepreneur and was very active in the community, local charities and her church where she sang in the choir. She was also a member of the Ponca City Country Club where she enjoyed golfing and swimming. She was an avid OU fan and was the founder and original owner of the Rusty Barrel Supper Club. However, out of all of her titles the ones she was most proud of were that of Mother, Grandmother and Great Grandmother - she viewed those as her greatest accomplishments. Janice was beloved by many, she had a huge loving heart and was beautiful both inside and out. Janice is survived by her sons Doug Perry and Curt Perry both of Ponca City, three grandsons T.C. Herrick and wife Shannese, Kehlan Herrick and wife Dacia and Brad Perry, and granddaughter Courthey Perry. She is also survived by her grandchildren Peyton Herrick, Amy Herrick, Kimber Herrick and Phaden Herrick, her brother Herb Small and wife Eileen and sister Arlene Thomas and many nephews and nieces. Janice is preceded in death by her parents Herbert K and Florence Small, her husband E.C. Yeary and her daughter Paige Perry Herrick. Pallbearers will be: T.C. Herrick, Kehlan Herrick, Herb Small, Herb Small Jr., Steve Kalmeyer, and Phaden Herrick. Contributions in lieu of flowers may be made to the Yeary Bell Fund at the First United Methodist church in Ponca City, 200 S. 6th St.
To send flowers or a remembrance gift to the family of Janice Yeary, please visit our Tribute Store. "Email Address" would like to share the life celebration of Janice Yeary. Click on the "link" to go to share a favorite memory or leave a condolence message for the family.